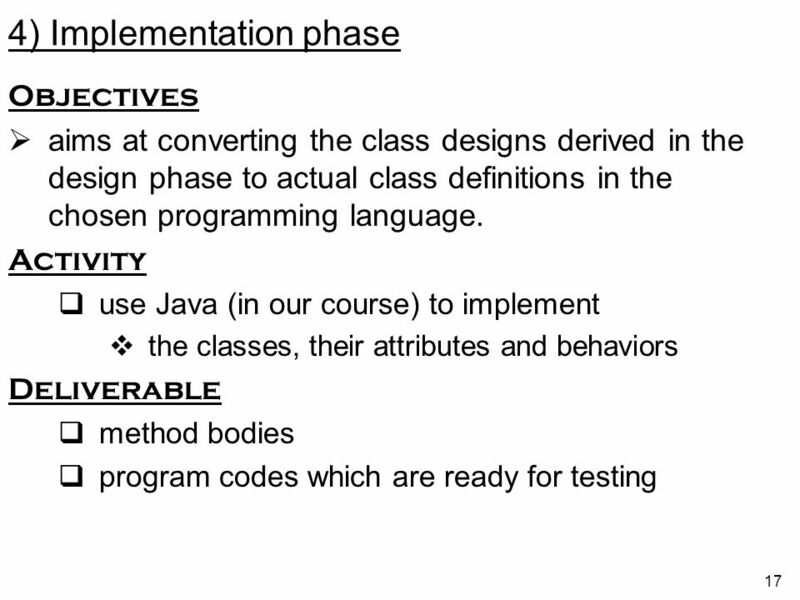 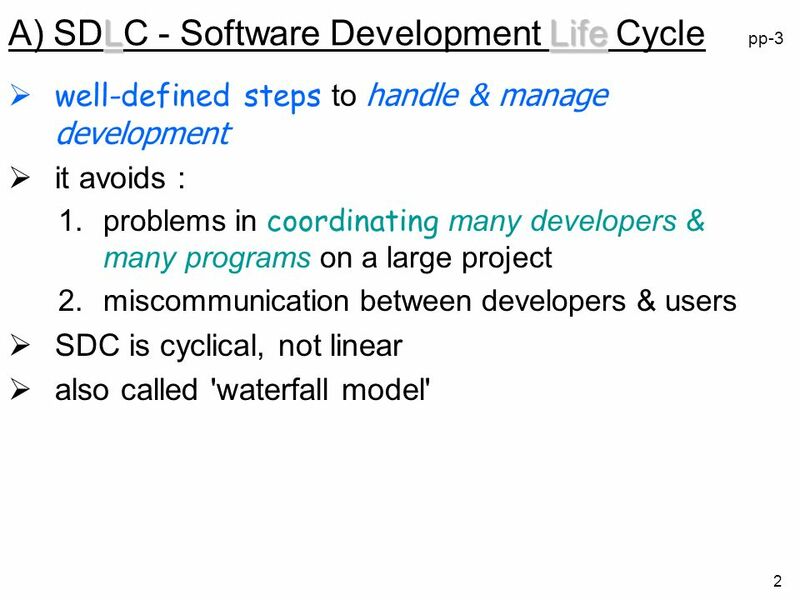 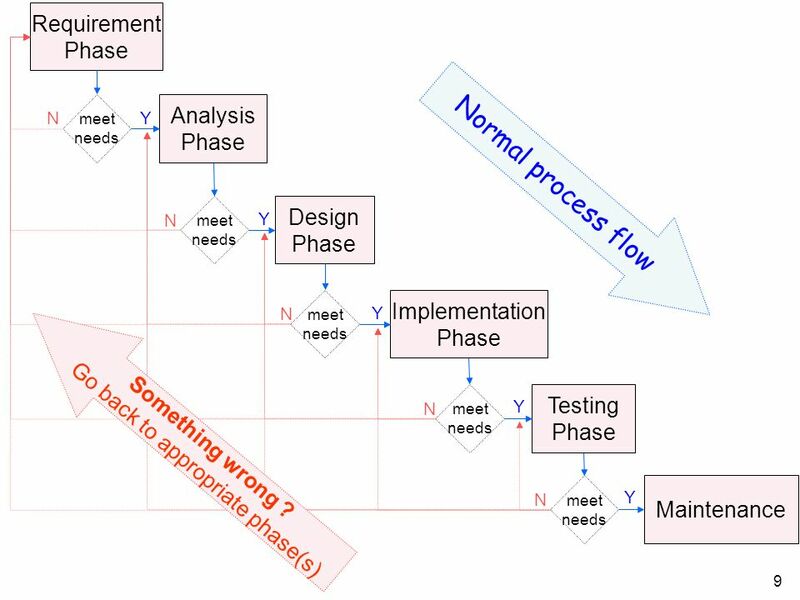 According to nature of common activities in s/w development, it is divided into 6 phases: Requirements phase Analysis phase Design phase Implementation phase Testing phase Maintenance phase Simple software : a single pass may suffice Sophisticated software might be too complicated to build with a single pass through these 6 phases. 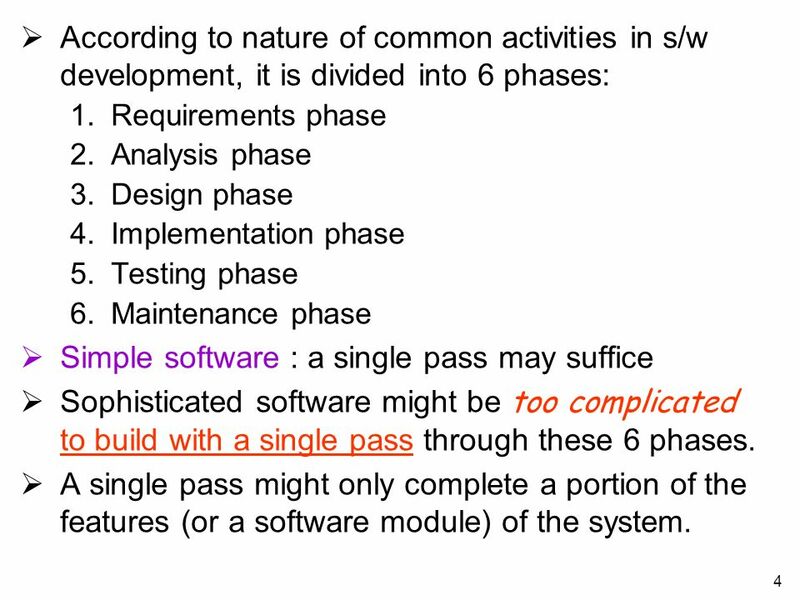 A single pass might only complete a portion of the features (or a software module) of the system. 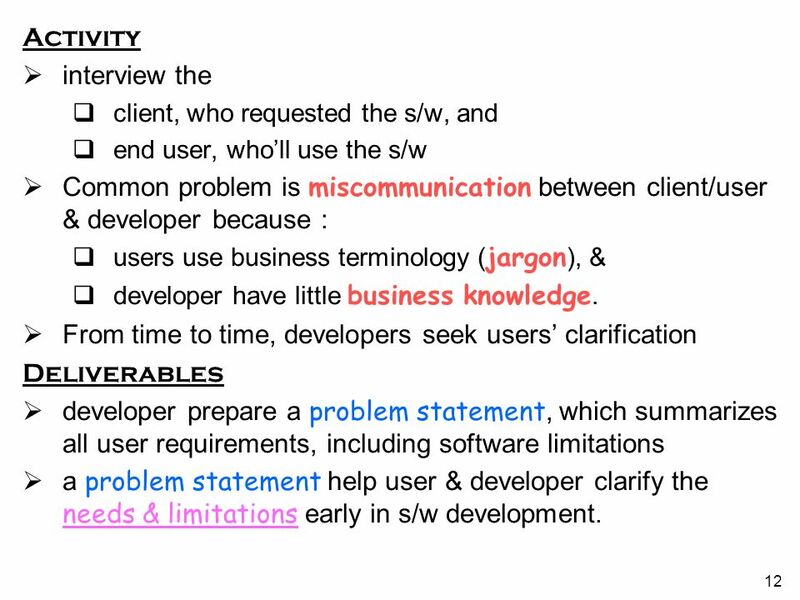 Activity interview the client, who requested the s/w, and end user, who’ll use the s/w Common problem is miscommunication between client/user & developer because : users use business terminology (jargon), & developer have little business knowledge. 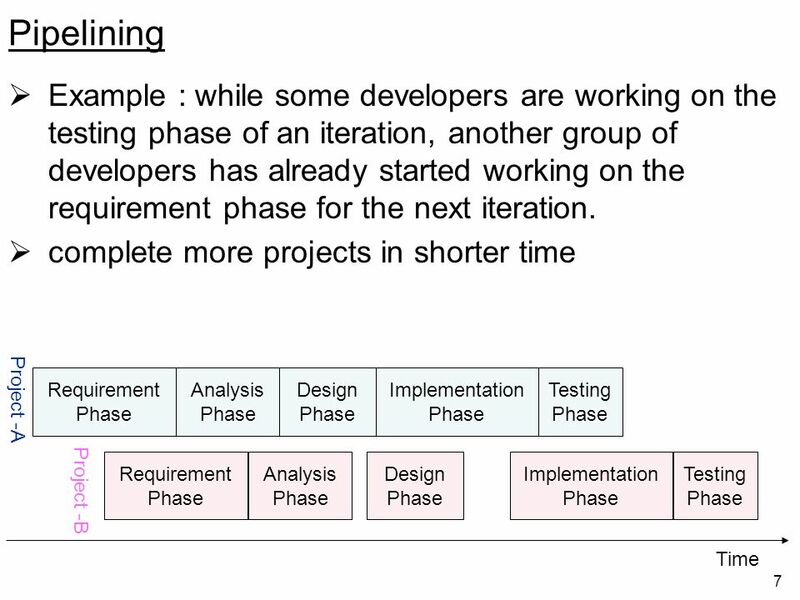 From time to time, developers seek users’ clarification Deliverables developer prepare a problem statement, which summarizes all user requirements, including software limitations a problem statement help user & developer clarify the needs & limitations early in s/w development. 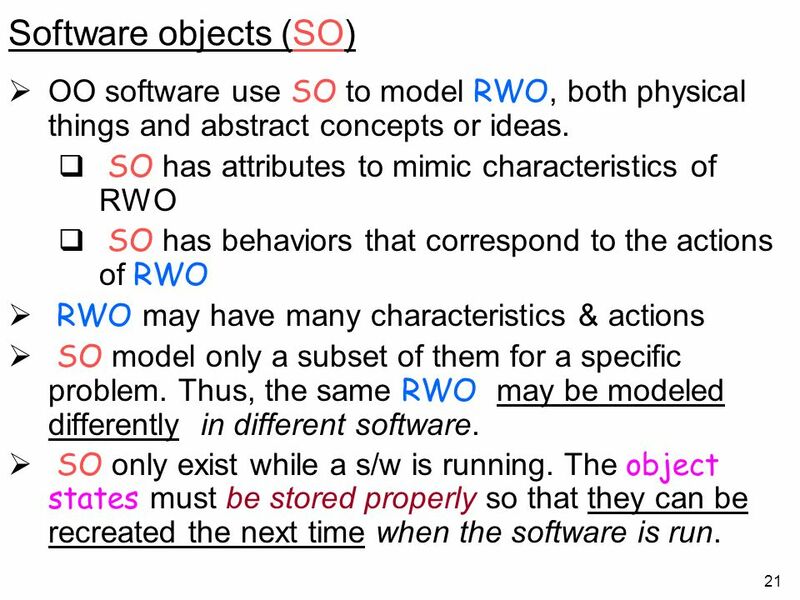 21 Software objects (SO) OO software use SO to model RWO, both physical things and abstract concepts or ideas. 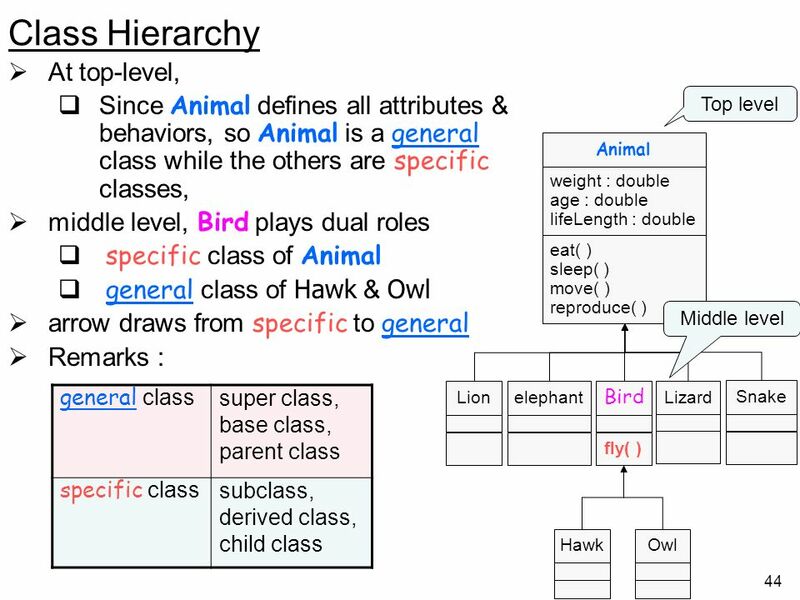 SO has attributes to mimic characteristics of RWO SO has behaviors that correspond to the actions of RWO RWO may have many characteristics & actions SO model only a subset of them for a specific problem. 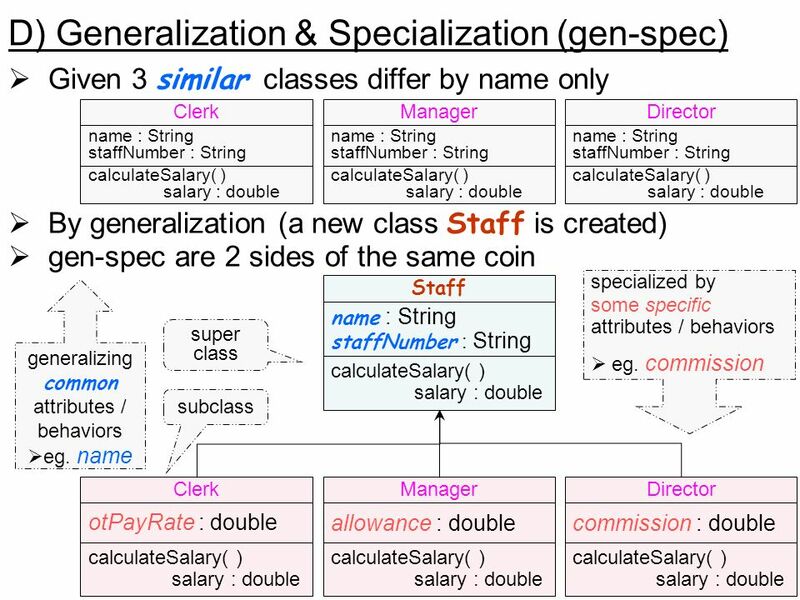 Thus, the same RWO may be modeled differently in different software. 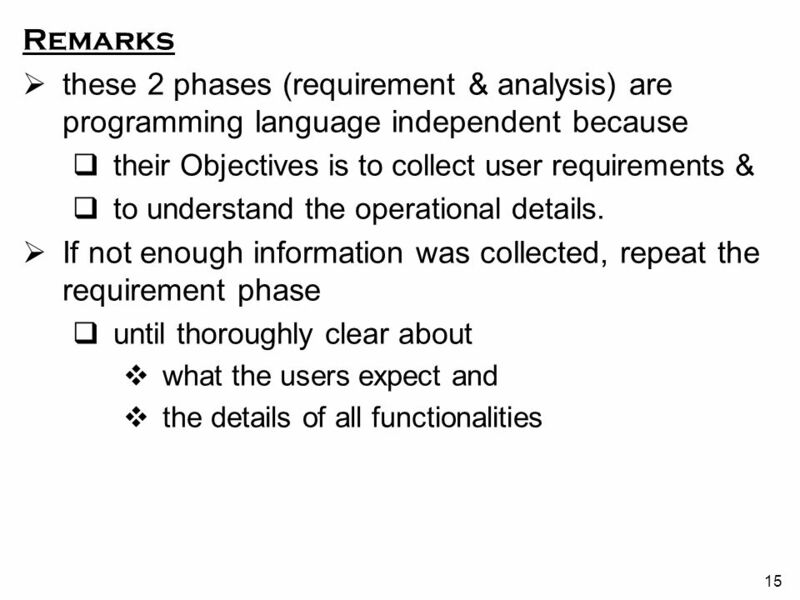 SO only exist while a s/w is running. 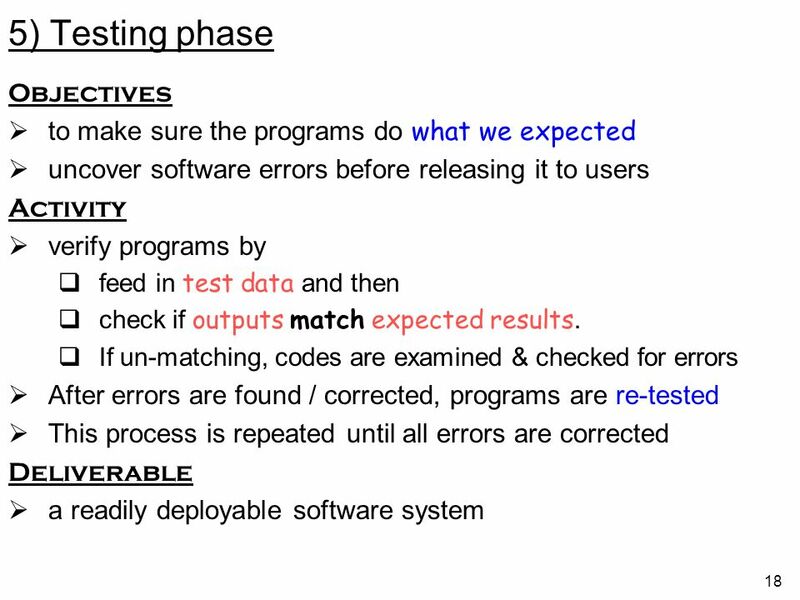 The object states must be stored properly so that they can be recreated the next time when the software is run. 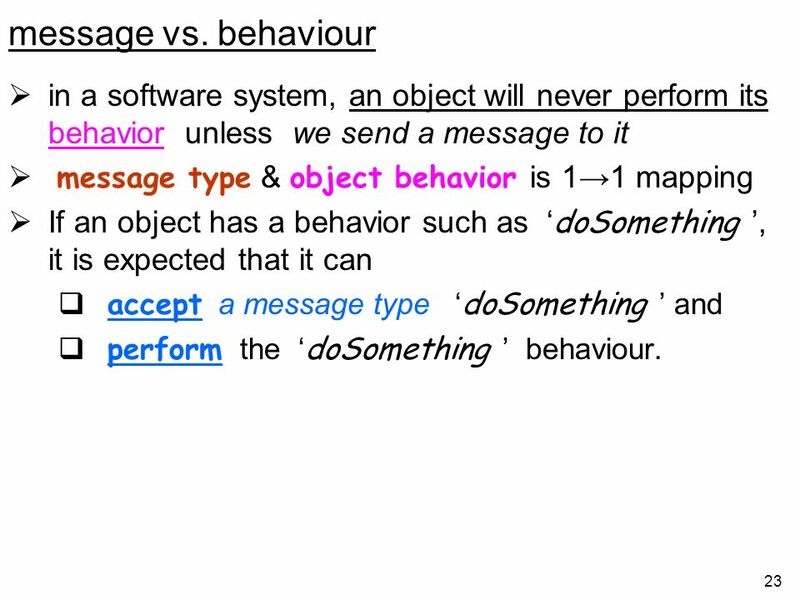 23 message vs. behaviour in a software system, an object will never perform its behavior unless we send a message to it message type & object behavior is 1→1 mapping If an object has a behavior such as ‘doSomething ’, it is expected that it can accept a message type ‘doSomething ’ and perform the ‘doSomething ’ behaviour. 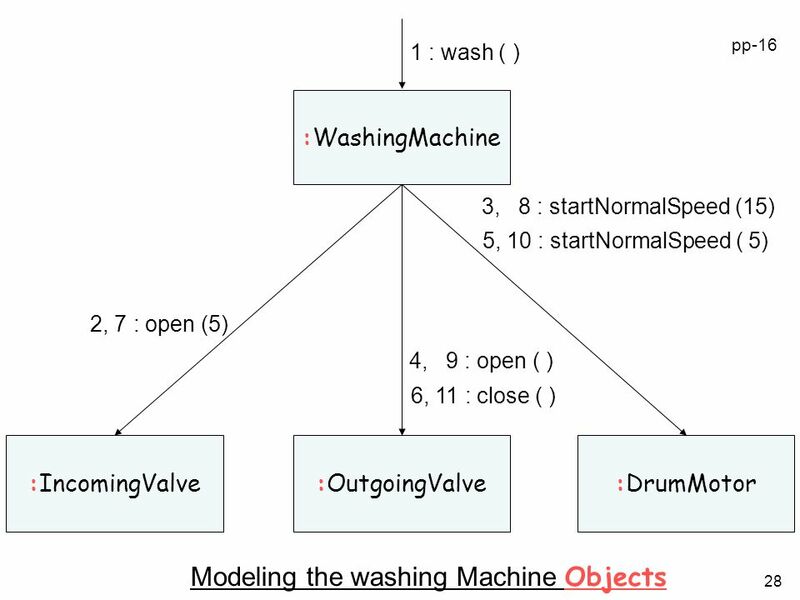 pp-15 'Start Washing' button of washing machine is pressed The incoming water valve is opened for 5 minutes. 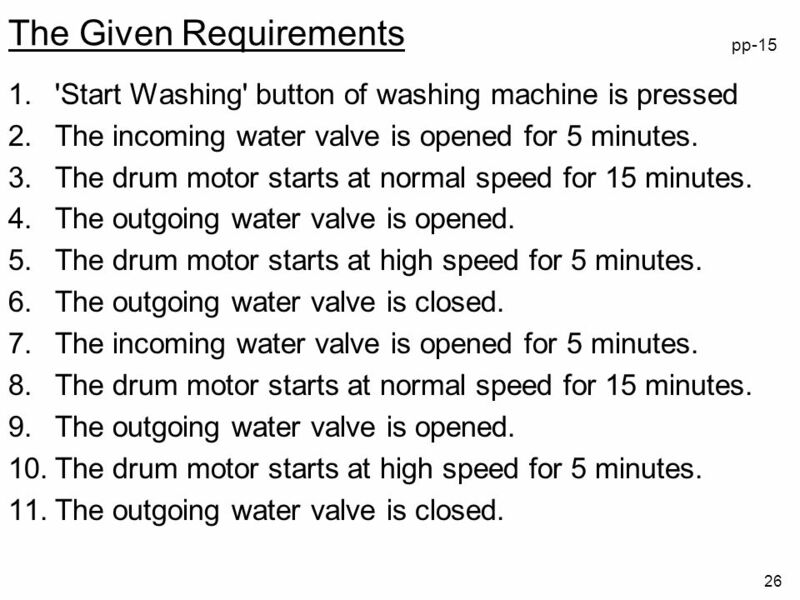 The drum motor starts at normal speed for 15 minutes. 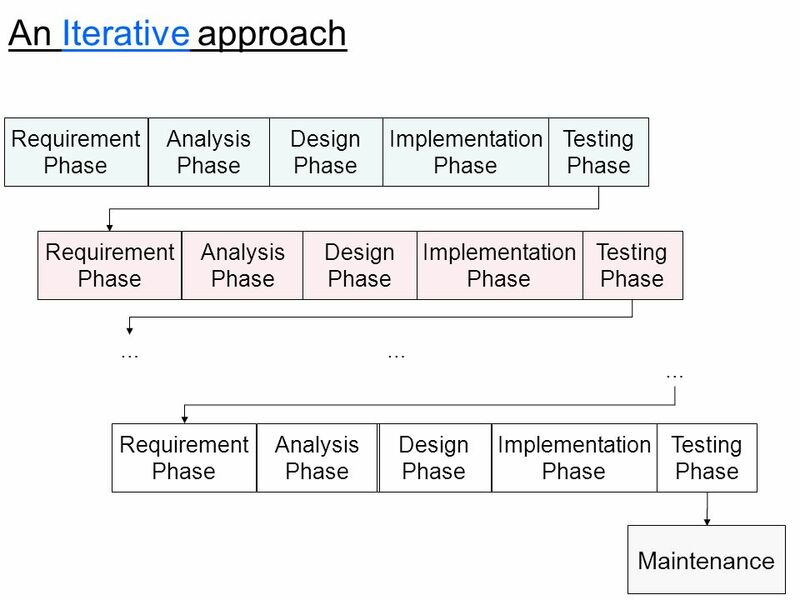 The outgoing water valve is opened. 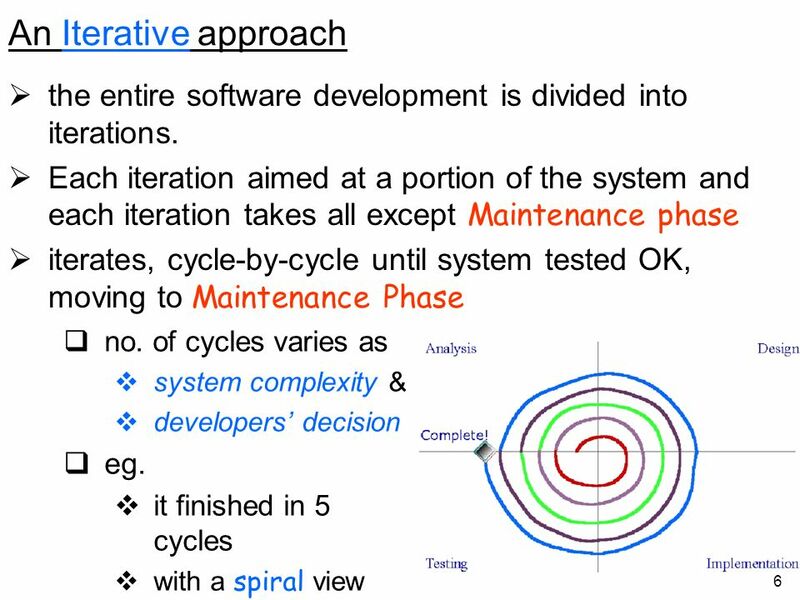 The drum motor starts at high speed for 5 minutes. 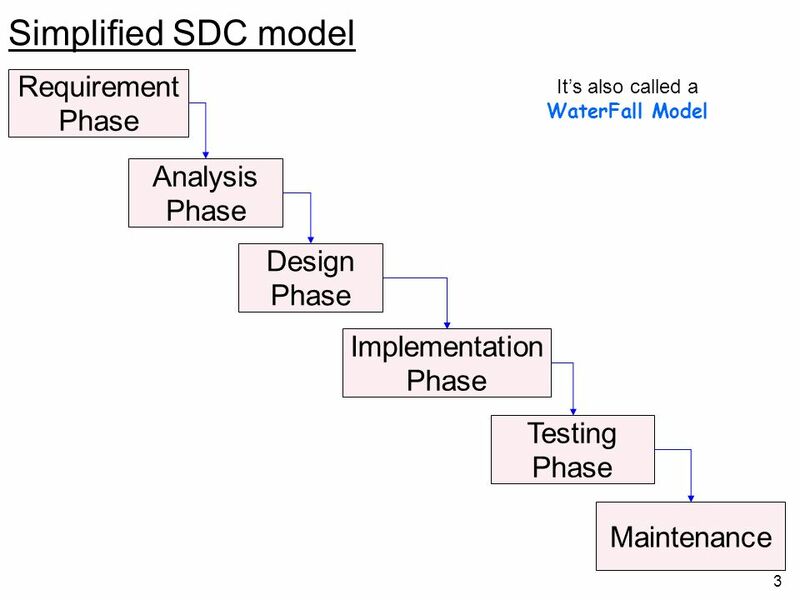 The outgoing water valve is closed. 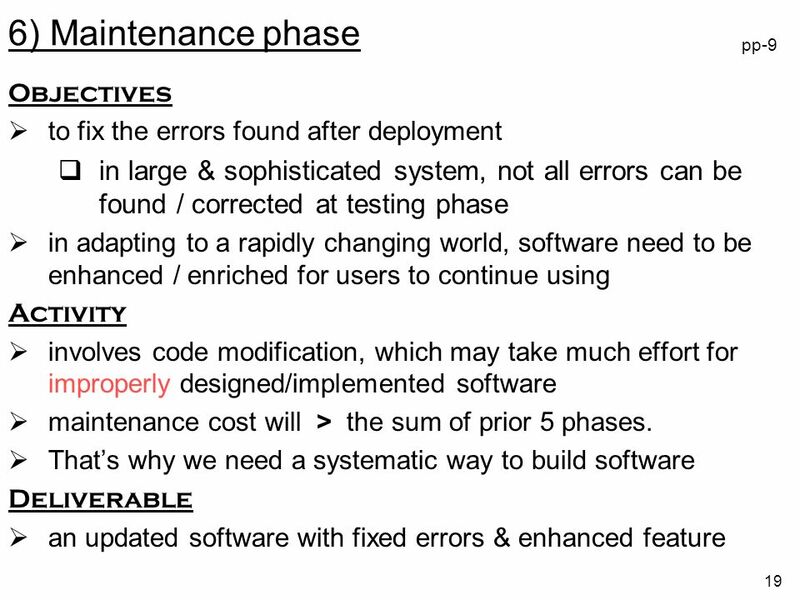 The outgoing water valve is closed. 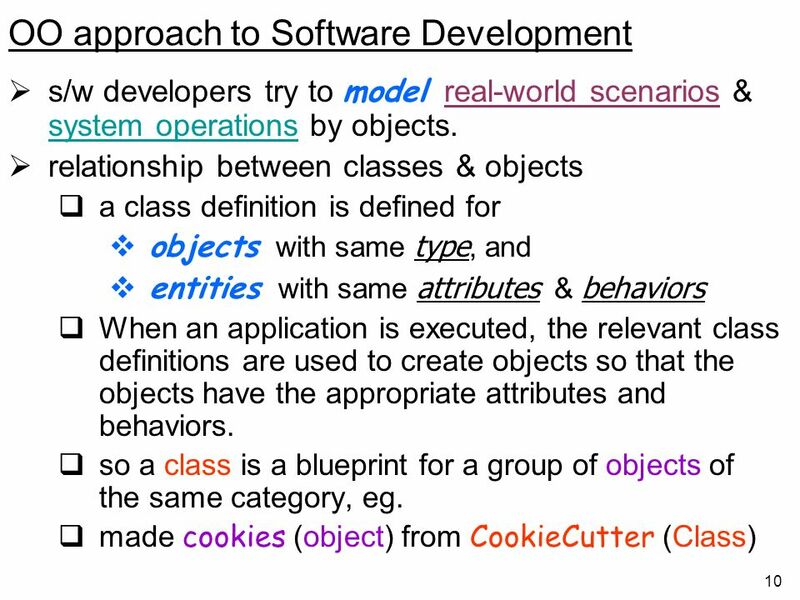 In OO programming, tasks always involve objects. 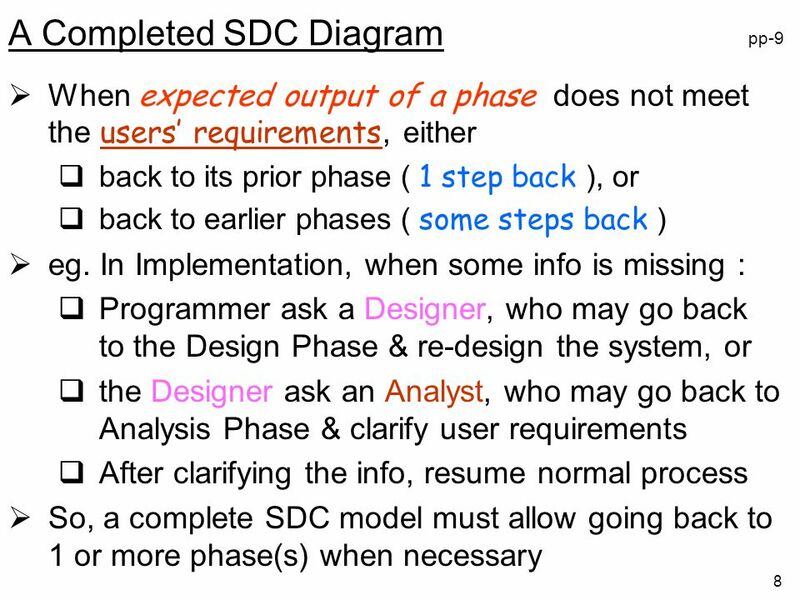 To complete a task, we expect some results will be returned from the objects or the states of some objects will be changed. 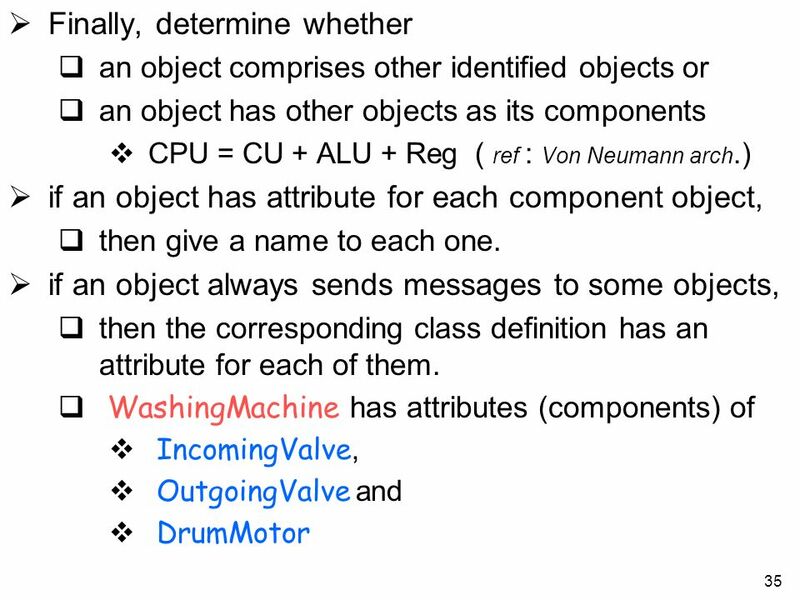 Suppose the objects WashingMachine, DrumMotor, IncomingValve and OutgoingValve have been found to be appropriate. 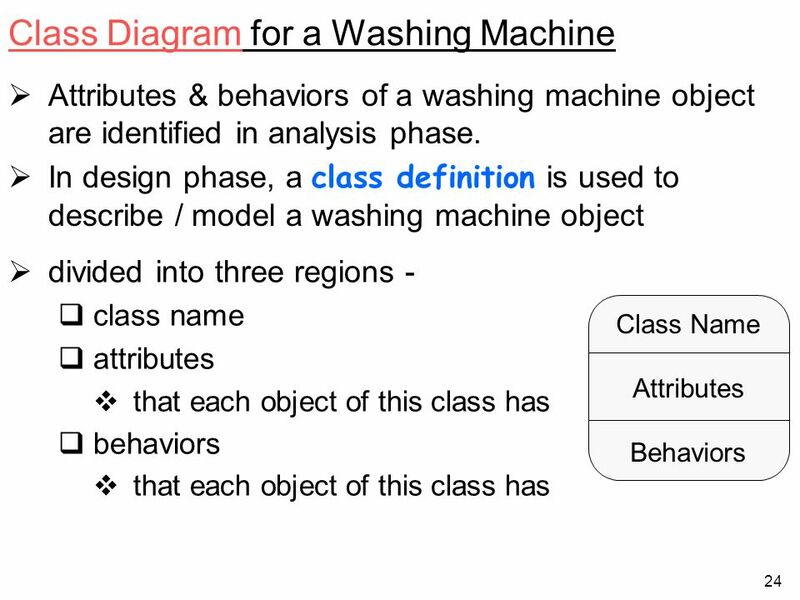 The washing operation can be accomplished by messages sent among the objects. 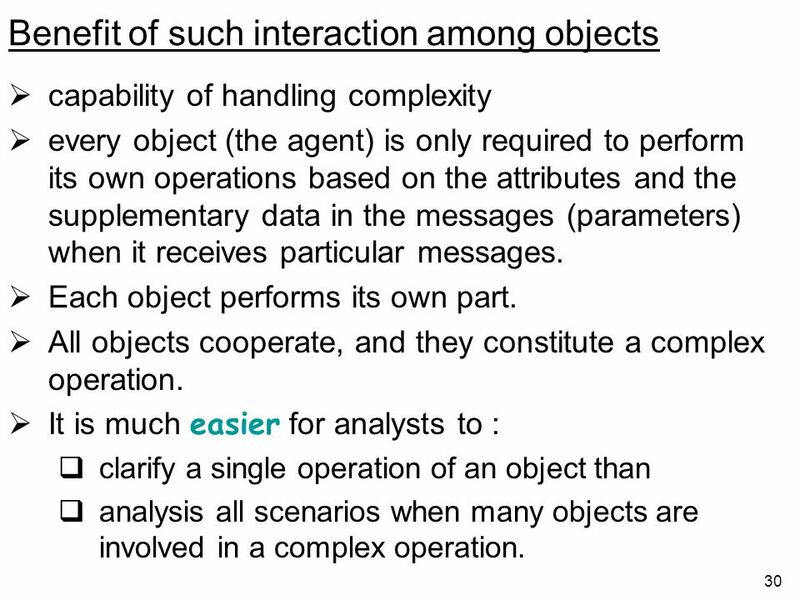 capability of handling complexity every object (the agent) is only required to perform its own operations based on the attributes and the supplementary data in the messages (parameters) when it receives particular messages. 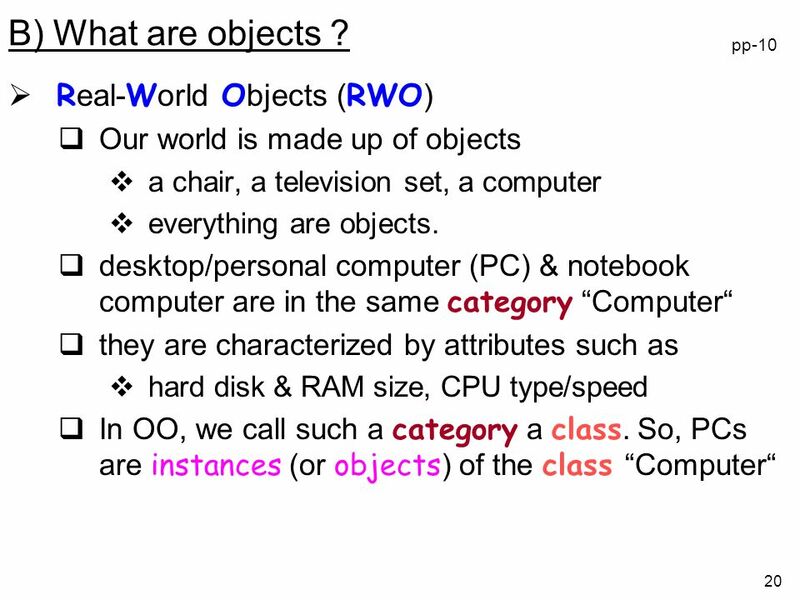 Each object performs its own part. 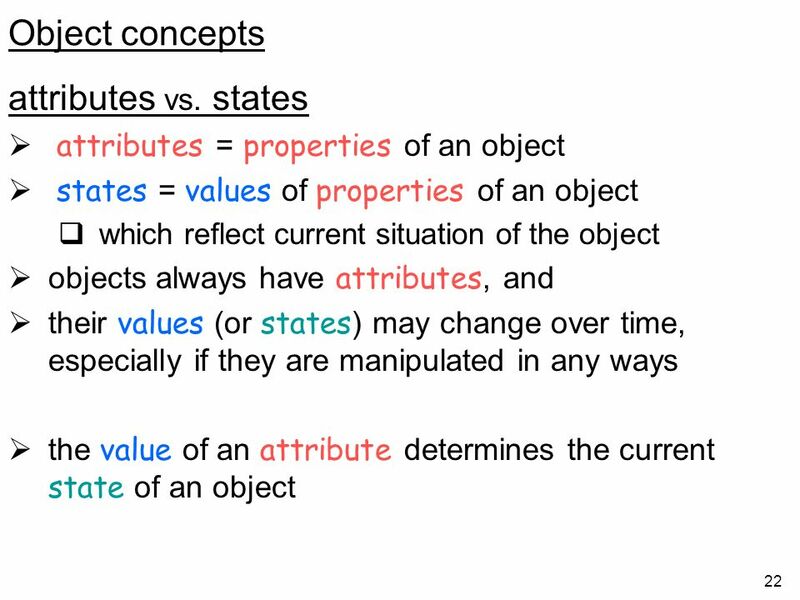 All objects cooperate, and they constitute a complex operation. 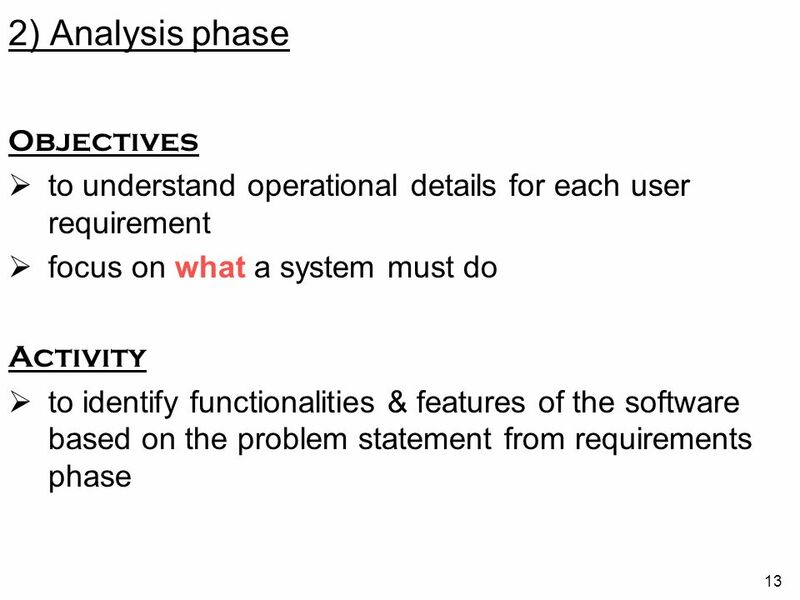 It is much easier for analysts to : clarify a single operation of an object than analysis all scenarios when many objects are involved in a complex operation. 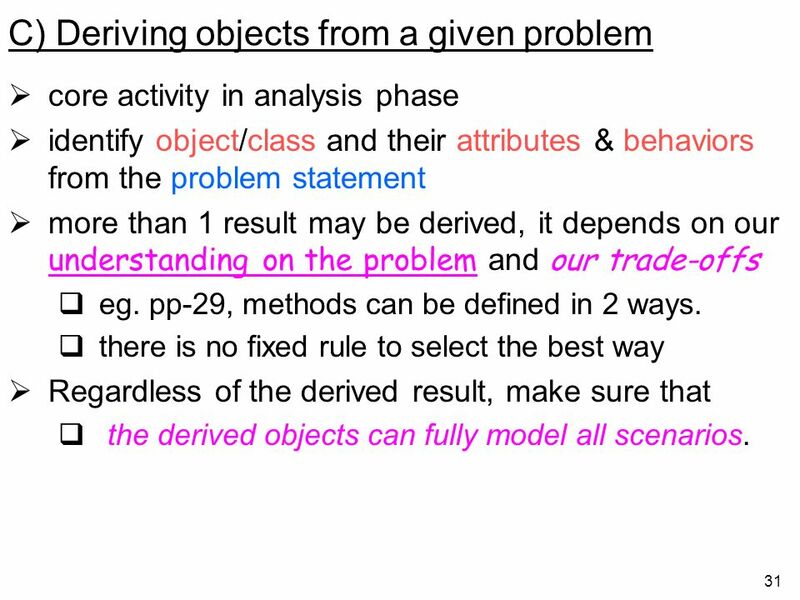 core activity in analysis phase identify object/class and their attributes & behaviors from the problem statement more than 1 result may be derived, it depends on our understanding on the problem and our trade-offs eg. 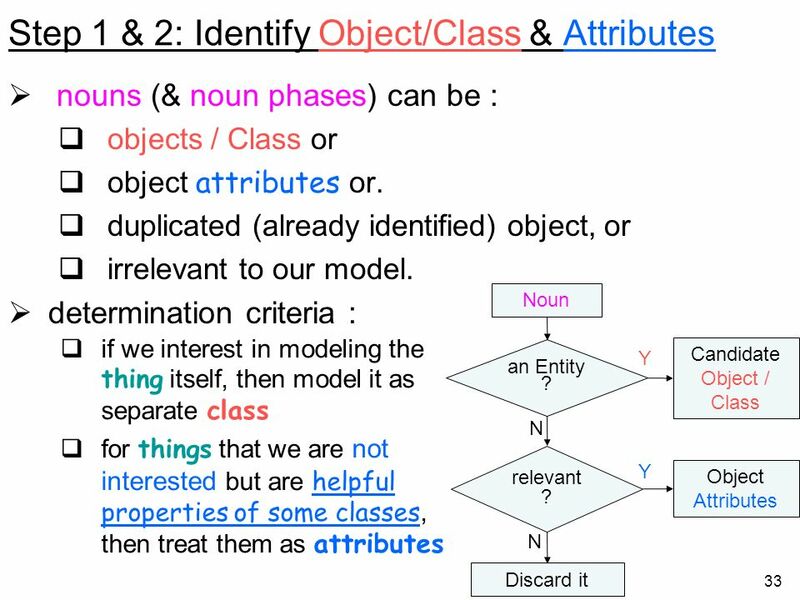 pp-29, methods can be defined in 2 ways. 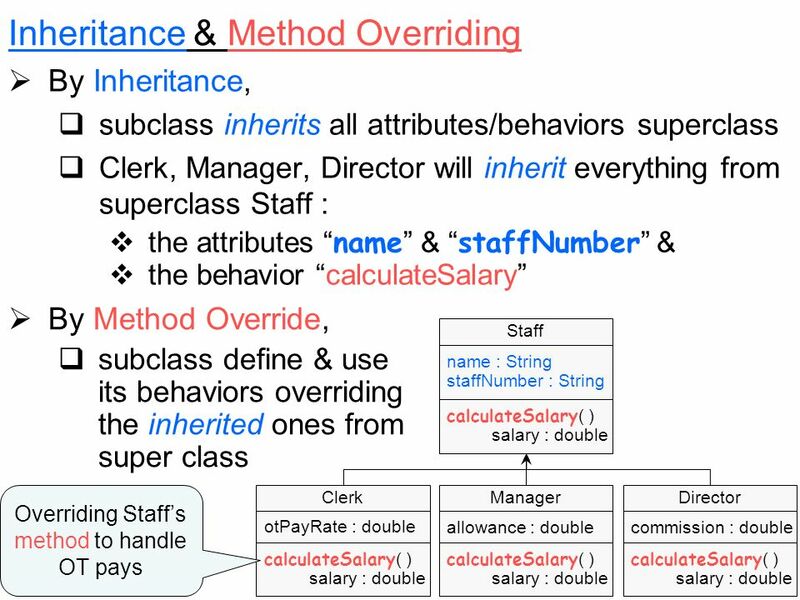 there is no fixed rule to select the best way Regardless of the derived result, make sure that the derived objects can fully model all scenarios. 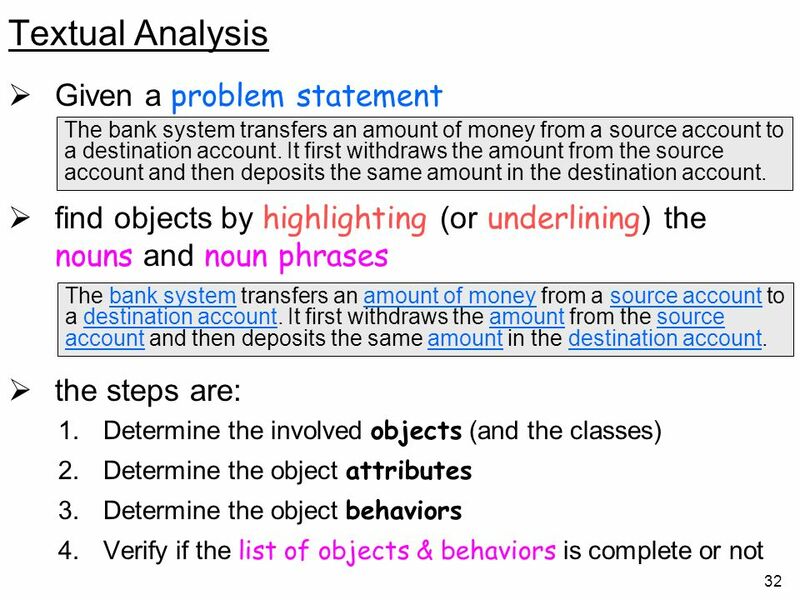 find objects by highlighting (or underlining) the nouns and noun phrases the steps are: Determine the involved objects (and the classes) Determine the object attributes Determine the object behaviors Verify if the list of objects & behaviors is complete or not The bank system transfers an amount of money from a source account to a destination account. 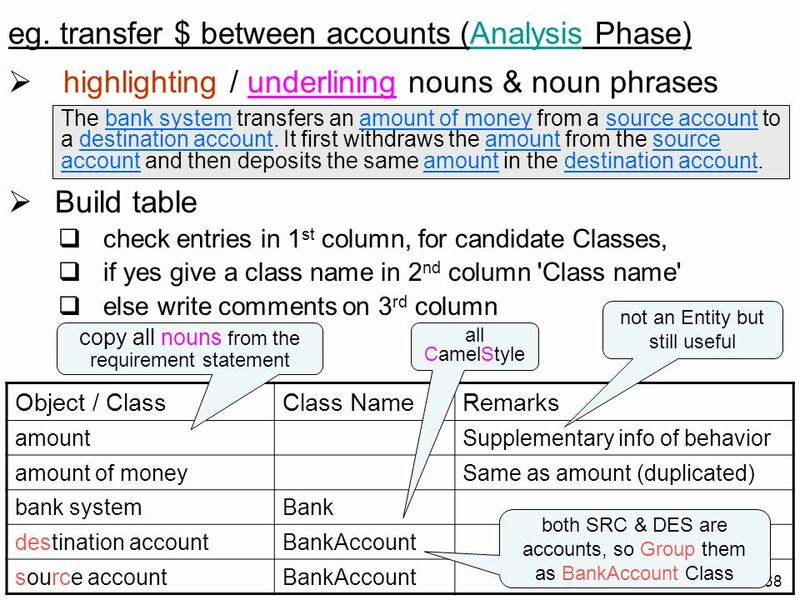 It first withdraws the amount from the source account and then deposits the same amount in the destination account. 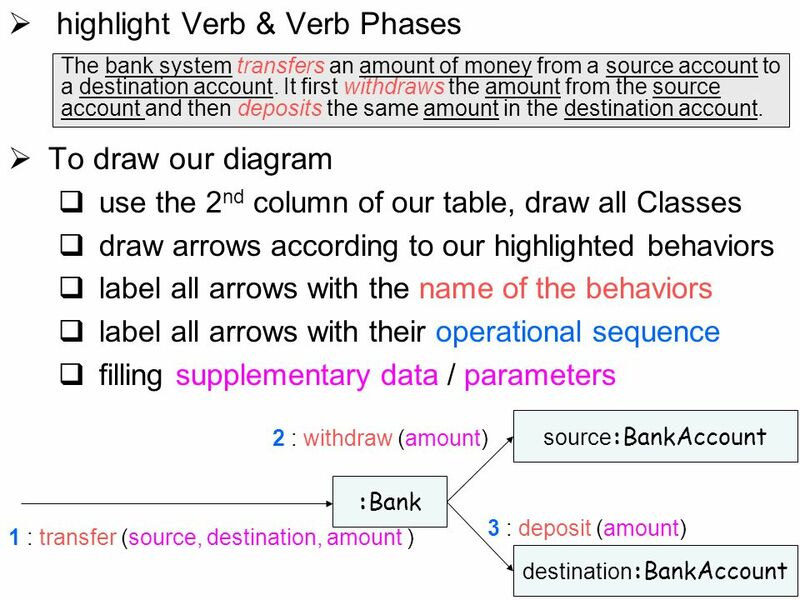 The bank system transfers an amount of money from a source account to a destination account. 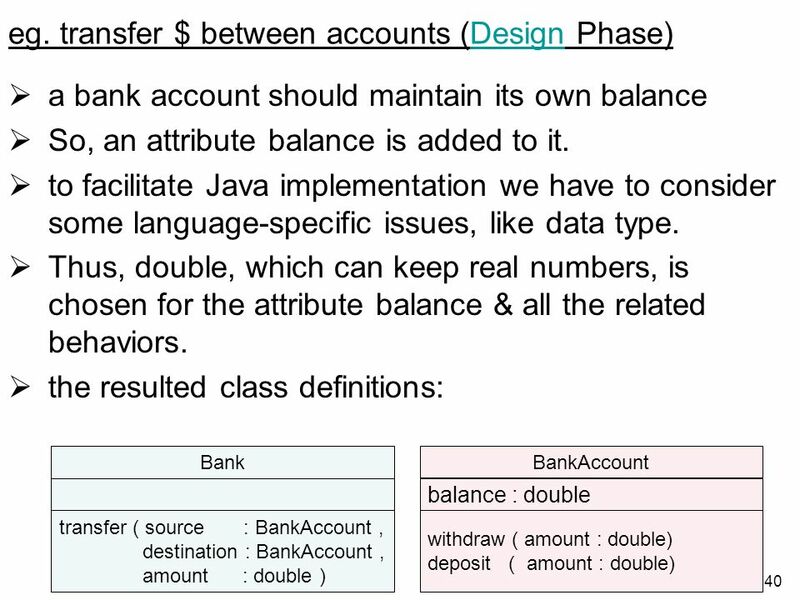 It first withdraws the amount from the source account and then deposits the same amount in the destination account. 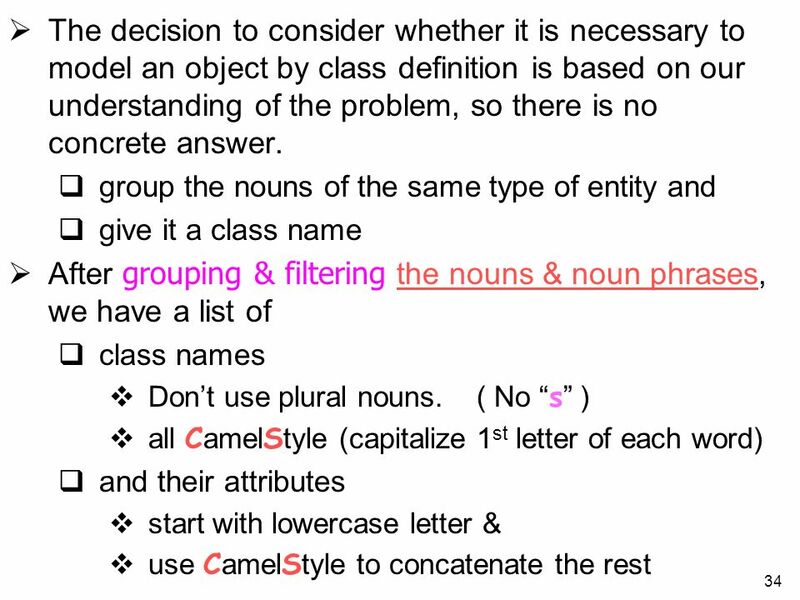 generate a list of potential object behaviors by identifying verbs & verb phases in the problem statement if 2 different verbs are referring to the same behavior, then choose any one of them. 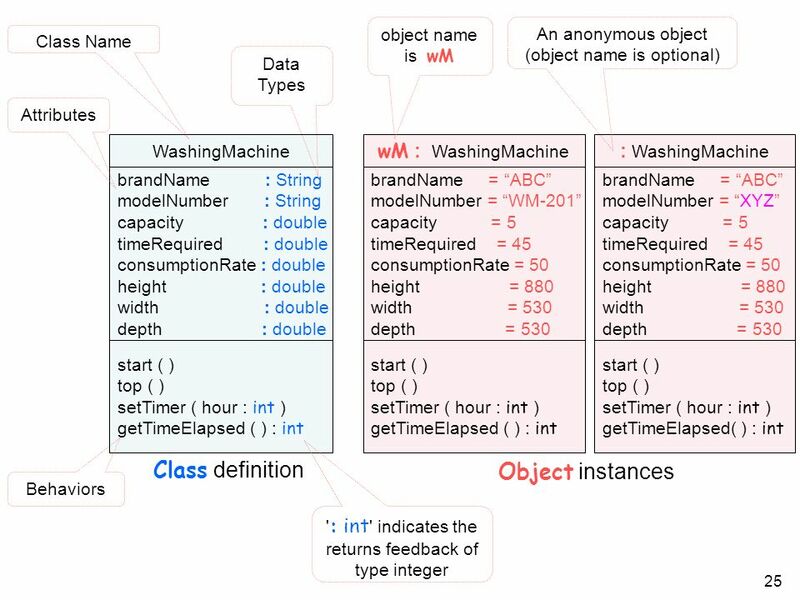 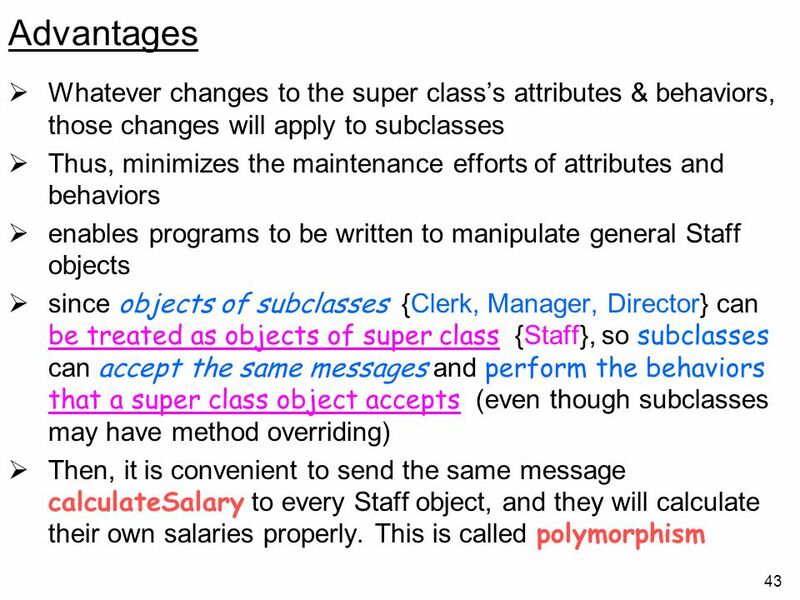 check which object(& class) has these behaviors eg. 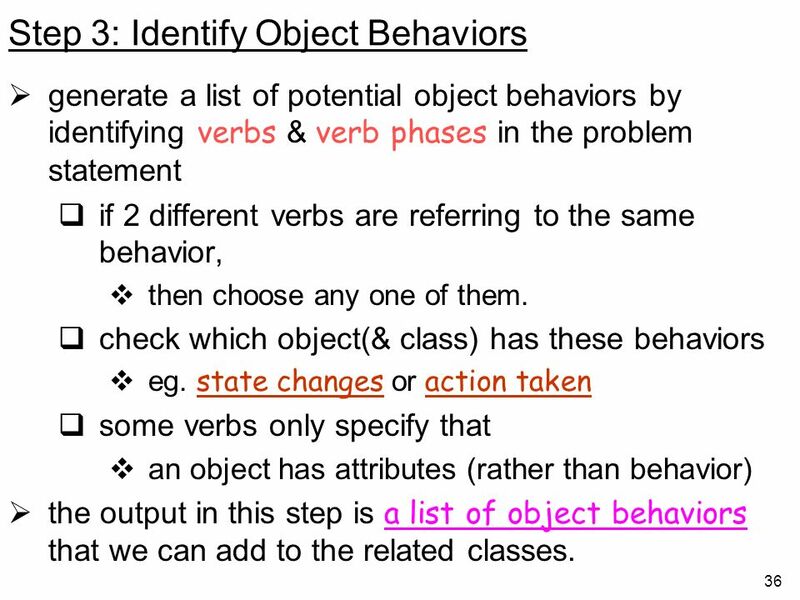 state changes or action taken some verbs only specify that an object has attributes (rather than behavior) the output in this step is a list of object behaviors that we can add to the related classes. 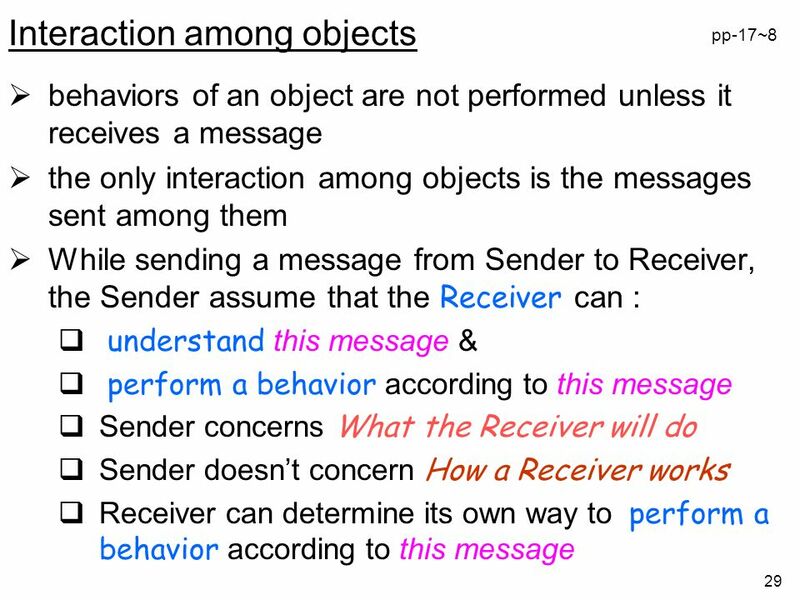 Analysis the scenarios when messages are sending among objects. 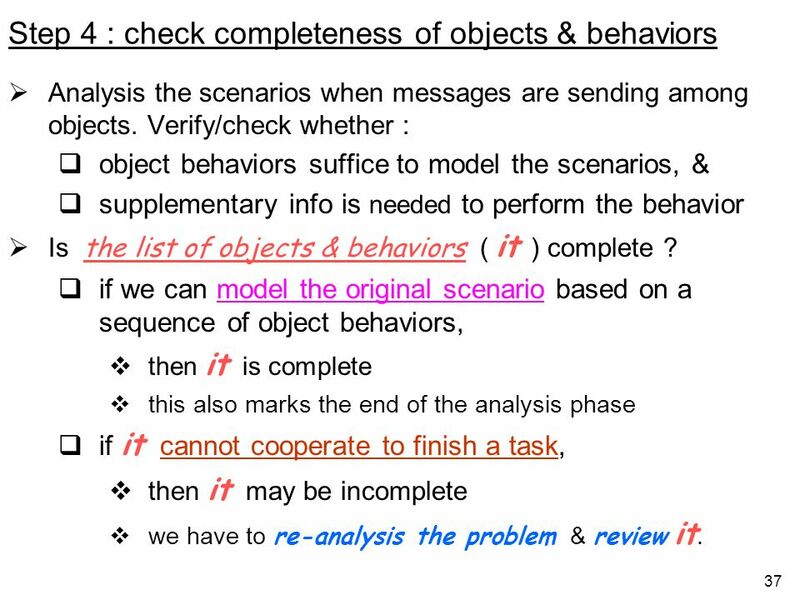 Verify/check whether : object behaviors suffice to model the scenarios, & supplementary info is needed to perform the behavior Is the list of objects & behaviors ( it ) complete ? 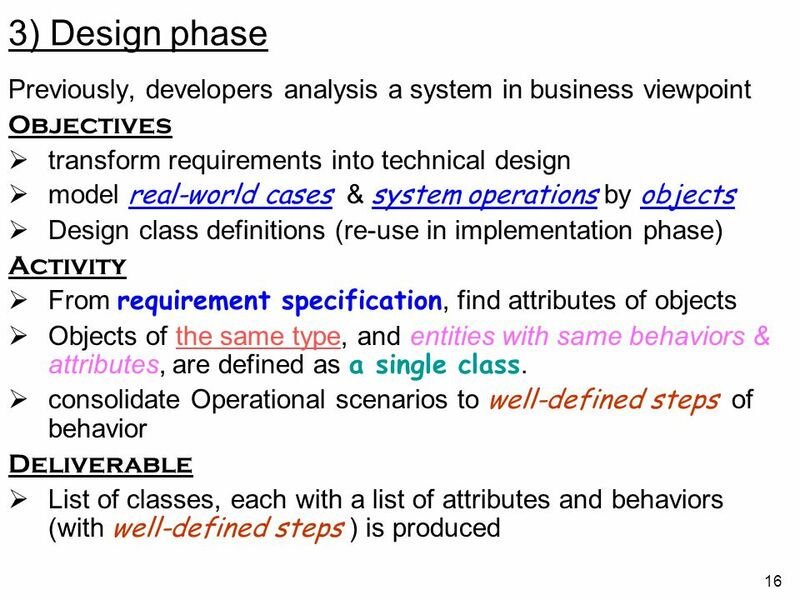 if we can model the original scenario based on a sequence of object behaviors, then it is complete this also marks the end of the analysis phase if it cannot cooperate to finish a task, then it may be incomplete we have to re-analysis the problem & review it. 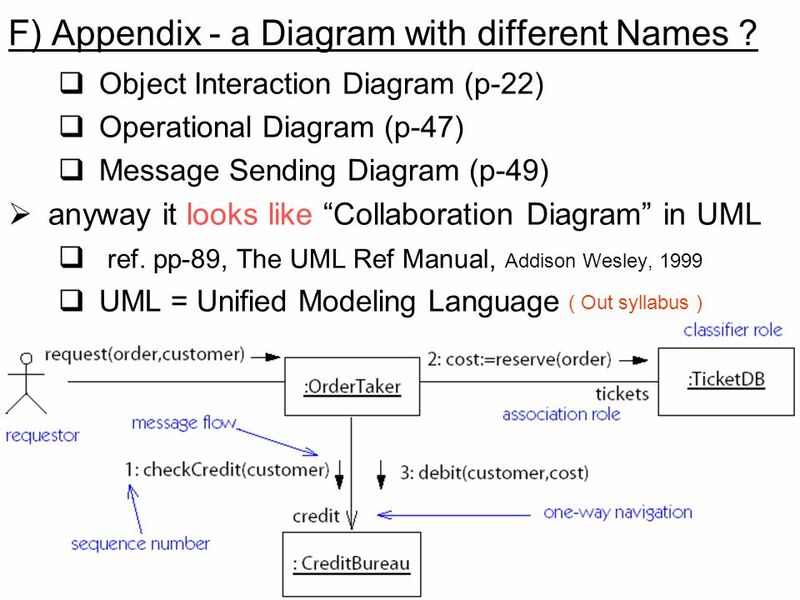 46 F) Appendix - a Diagram with different Names ? 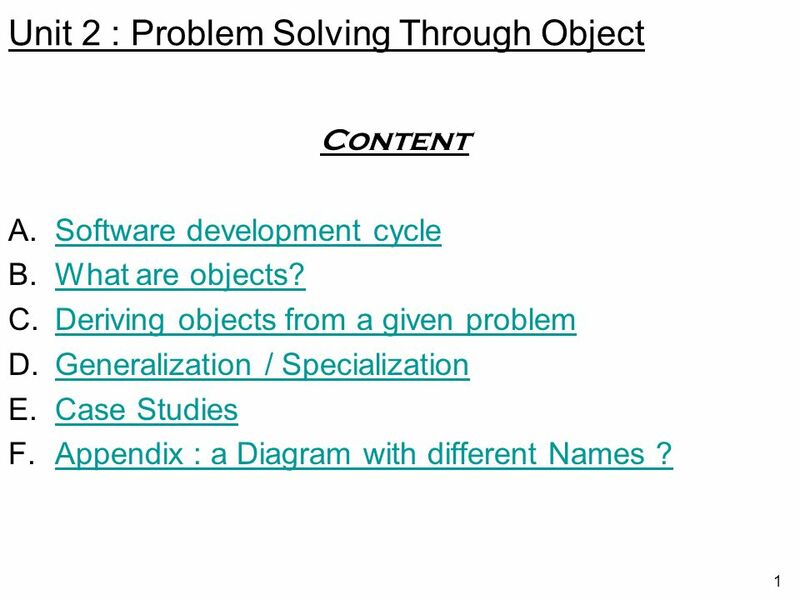 Download ppt "Unit 2 : Problem Solving Through Object"
Chapter 12 Working with Forms Principles of Web Design, 4 th Edition.